GOAL: Make the entry courtyard welcoming and more secure. The main entry for a two-story urban townhouse is through a small 12’ x 15’ fenced courtyard. 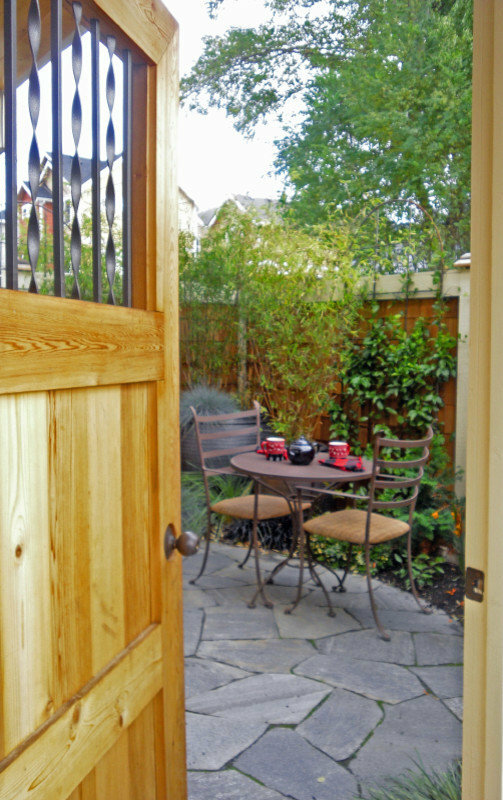 The new custom courtyard entry door is now locked and the area is more secure. The interior design is modern-urban with well-chosen finishes and stylish comfortable furnishings. Throughout are jewel-toned colors and many artistic pieces. The second floor Great Room looks down onto the fenced entry from a narrow balcony. The courtyard was too utilitarian. A more gracious entry area was the goal. Year-round attractiveness was achieved through the selection of a variety of appropriately scaled materials and a texturally interesting planting palette. The fence was sided with shingles matching the condominium. Four substantial containers provide the vertical layering of the garden room. 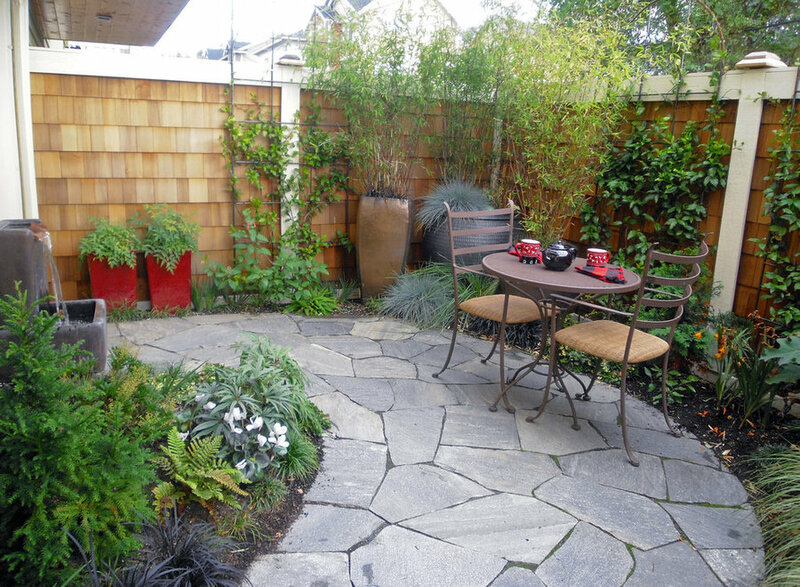 The mix of conifers, shrubs, ferns, grasses and tiny groundcovers soften the small enclosed area. Walking the curved sweep of flagstone naturally directs the visitor’s eye around the courtyard garden. 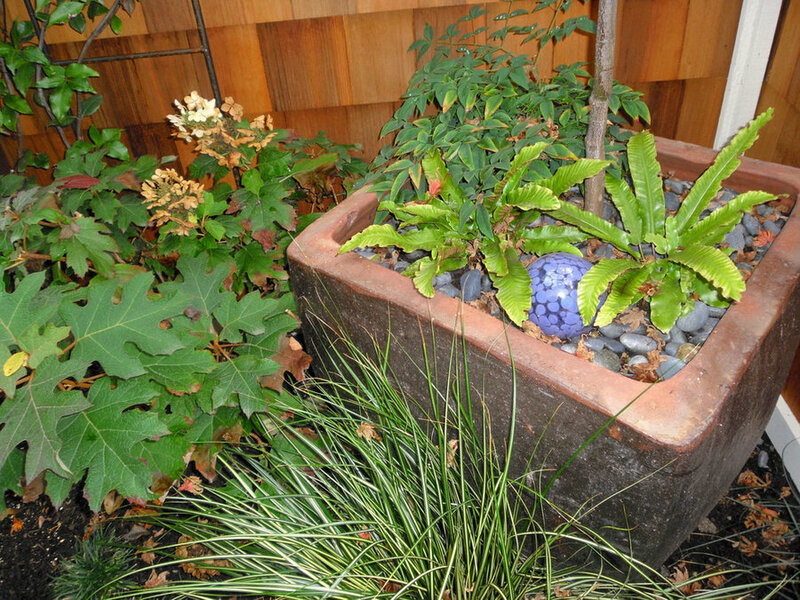 The sheen of the flagstone echoes the metallic glazes of the planted containers. A petite modern fountain obscures the hum of urban noise. Tall evergreen vine-covered wire trellises and the tall shrub filled containers help hide unwanted views of close neighboring properties. The proportion of the hardscaping to the planting beds and the scale of the selected elements make the entry courtyard appear more generously sized than it really is. And it now echoes the stylish interior. Land2c A small entry courtyard has seating for two, a fountain to baffle urban noise, shingled fencing that now matched the building. Metal trellises hold Star Jasmine vines that soften the wooden 'walls' greening up the entry. 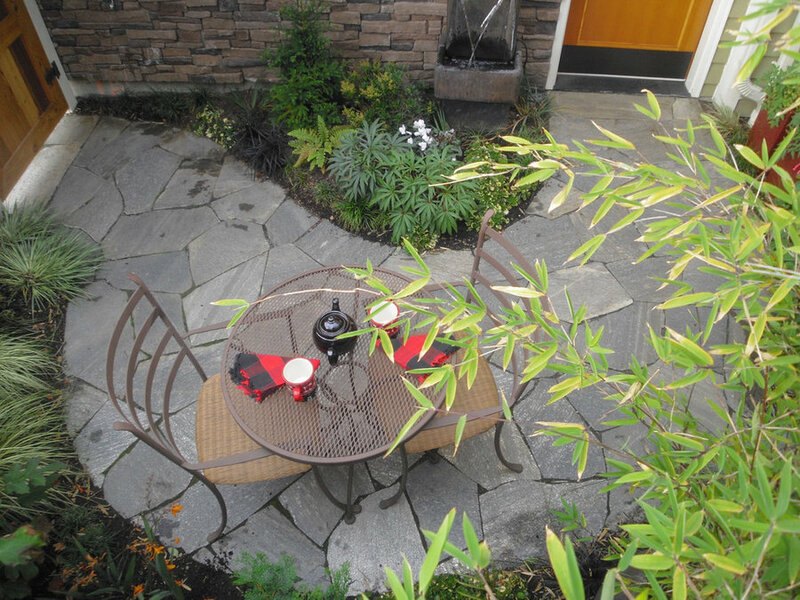 Several tall ceramic pots add height and sheen to the only outdoor seating area. 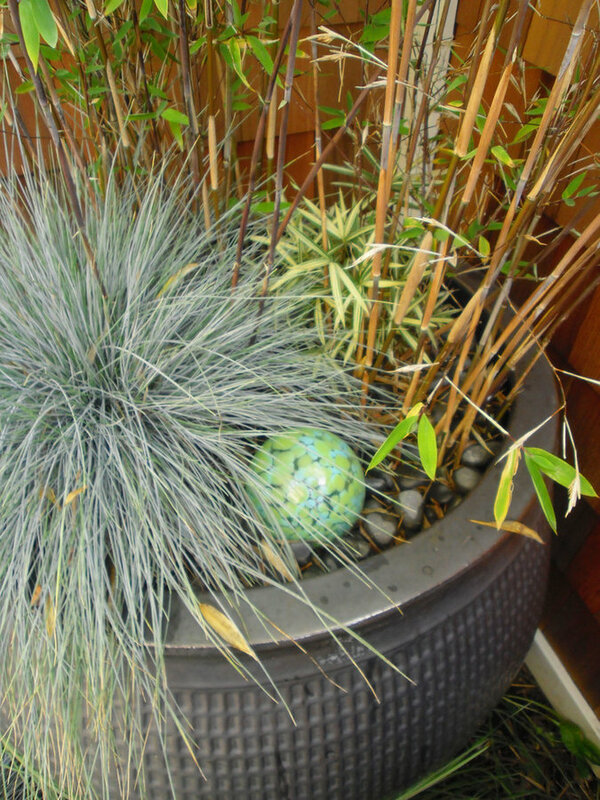 Land2c Large gray ceramic pot holds Blue Fescue, clumping bamboo, dwarf bamboo, and a glass ball. Land2c A small entry courtyard has seating for two, a fountain to baffle urban noise, shingled fencing that now matched the building. Metal trellises hold Star Jasmine vines that soften the wooden 'walls' greening up the entry. Several tall ceramic pots add height and sheen to the only outdoor seating area. The area has seating for two, a fountain to baffle urban noise, and shingled fencing that now matched the building. Metal trellises hold Star Jasmine vines that soften the wooden 'walls' greening up the entry area. Several tall ceramic pots add height and sheen to the only outdoor seating area. The largely evergreen plants have interesting textures and a variety of heights and colors. The sheen of the ceramic pots and the sparkle in the stone dresses up the small entry court hinting at the polished interior of the condo home. Land2c The custom locking gate provides security for this condo home. The small entry courtyard has seating for two, a fountain to baffle urban noise, shingled fencing that now matched the building. Metal trellises hold Star Jasmine vines that soften the wooden 'walls' greening up the entry.